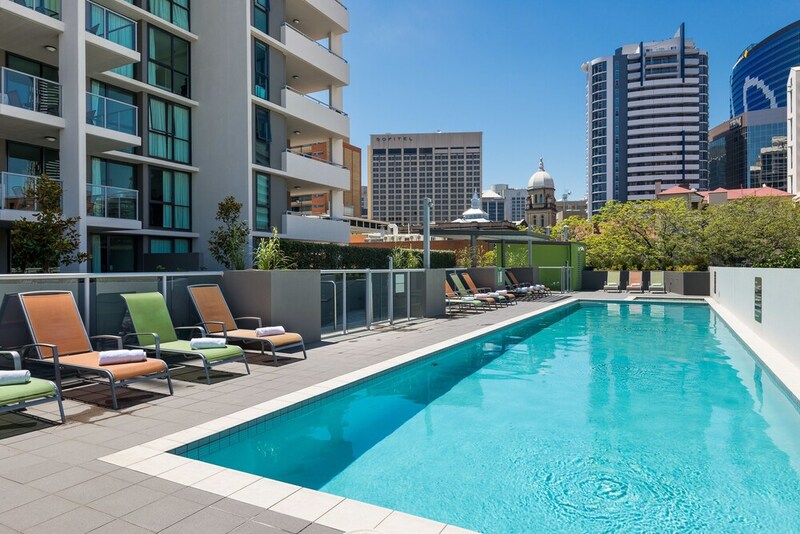 With a stay at Quest Spring Hill, you'll be centrally located in Spring Hill, within a 10-minute walk of Brisbane Private Hospital and Queen Street Mall. This 4.5-star apartment is 0.7 mi (1.2 km) from Roma Street Parkland and 1.3 mi (2.1 km) from Suncorp Stadium. Make yourself at home in one of the 60 air-conditioned rooms featuring kitchens with refrigerators and ovens. Rooms have private balconies or patios. LCD televisions and DVD players are provided for your entertainment, while complimentary wireless Internet access keeps you connected. Conveniences include phones, as well as desks and separate sitting areas. Be sure to enjoy recreational amenities, including an outdoor pool, a spa tub, and a fitness center. This apartment also features complimentary wireless Internet access, babysitting/childcare (surcharge), and tour/ticket assistance. At Quest Spring Hill, enjoy a satisfying meal at the restaurant. Wrap up your day with a drink at the bar/lounge. Cooked-to-order breakfasts are available daily from 7:00 AM to 11:00 AM for a fee. In addition to an outdoor pool, Quest Spring Hill provides a spa tub and a fitness center. The apartment offers a restaurant. A bar/lounge is on site where guests can unwind with a drink. Wireless Internet access is complimentary. A business center is on site at this 4.5-star property. This luxury apartment also offers a terrace, tour/ticket assistance, and barbecue grills. Guests can use the health club at a partner property. For a surcharge, a roundtrip airport shuttle (available 24 hours) is offered to guests. Onsite parking is available (surcharge). Quest Spring Hill is a smoke-free property. Cooked-to-order breakfasts are available for a surcharge and are served each morning between 7:00 AM and 11:00 AM. Quest Spring Hill has a restaurant on site. An outdoor pool and a spa tub are on site. Other recreational amenities include a fitness center. Rollaway/extra beds are available for AUD 35 per day. Cribs (infant beds) are available for AUD 15 per night. Accommodations are situated at multiple addresses. This property offers transfers from the airport (surcharges may apply). Guests must contact the property with arrival details before travel, using the contact information on the booking confirmation. Parking height restrictions apply.